THE Kerala budget which was presented to the assembly a day before the Union budget, has put the perspective of the working class in sharp focus. 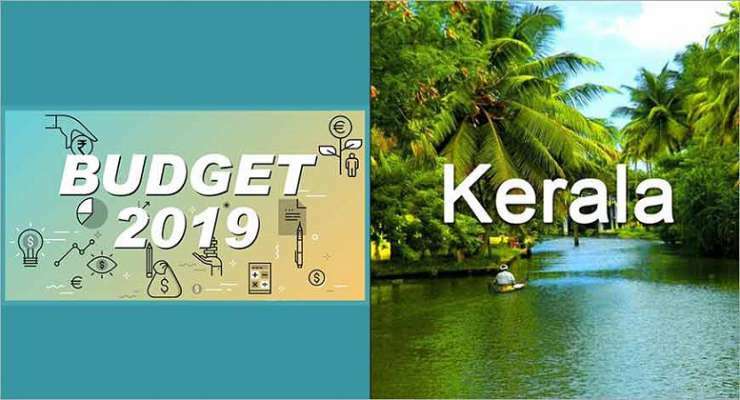 While the latter is full of non-stop jumlas aimed to subdue the brewing anger of the working people against its policies, the Kerala budget has signalled the consolidation of the gains for them. As the finance minister Thomas Issac rightly pointed out, the state suffered from two tragedies in the last year. The unprecedented rains caused the worst floods of the century bringing heavy damages to life and property. The economy was on standstill for the ensuing two months in the flood affected areas, impacting the livelihood of a major section. The relief and rehabilitation measures saw huge participation from all sections, with the fisherfolk of the state leading from the front. The central government allocation remained at Rs 3000 crores from the National Disaster Relief Fund (NDRF) as against the estimated damages of more than Rs 25,000 crores. The central government denied relief funds extended by foreign countries including UAE and didn't allow the state ministers to visit those countries in order to pool more funds. The centre deviated from its usual practice of allowing the state governments to borrow more than the limits stipulated by the Fiscal Responsibility and Budgetary Management Act, whenever they are faced with a major expenditure out of natural disasters. It stopped the state from raising its fiscal deficit limit (for that matter the FD limit for the centre in 2009-10, a recession year was 6.46 per cent). To add to this, the centre has even considered the window of state treasury savings as loans. While the BJP led government at the centre was on a plan to squeeze the resources of the flood hit state, the RSS-BJP ranks in the state latched on to the opportunity after the Sabarimala verdict of the Supreme Court constitution bench allowing entry of women of all ages, to initiate a venomous communal campaign against the Left Democratic Front government for implementing it. The Congress led United Democratic Front also sided with them. This was the second tragedy that the finance minister mentioned in his budget speech, during which we saw a deviation from the rock solid unity of the people of the state that was seen during the floods. An amount of Rs 3229 crores was received in the Chief Minister's Distress Relief Fund (CMDRF) from all over the world. In order to ensure 2-4 times higher relief amount to the flood victims, the state had to depend on CMDRF as the norms of the NDRF don't always suit the needs of the people. The 2019-20 budget plans to utilise Rs 4700 crores for livelihood development. The effort of the state government to use the MGNREGS to its full potential to tide over the crisis in employment is nearing fruition. The state has been able to clock an all time high of 10 crore working days equivalent to Rs 2500 crores as wages in 2018-19. This effort will be continued in the next financial year as well. Livelihood rehabilitation loan schemes with an outlay of Rs 11,000 crores are also planned. Besides this, an ambitious programme under Rebuild Kerala Initiative, an environment friendly programme, by adopting modern technologies to 'build back better', is also being planned with an initial outlay of Rs 1000 crores. Agriculture sector receives Rs 2500 crores and it would be spent on a host of projects to supplement the income of coffee, paddy, coconut and rubber growers. The branding and marketing of 'Malabar coffee', a scheme for planting a million coconut trees and schemes to ensure support price for rubber and paddy are a few of these. Kuttanad package with an outlay of Rs 1000 crores will be spent on wetland cultivation, providing drinking water, pisciculture and tourism. Thaneermukkom bund would be kept open for a year on an experimental basis to chalk out an environment friendly plan for the area. The projects in the traditional industries aim at procuring raw material, modernisation of the existing machinery and product marketing. Information technology is poised for fresh advance as 1.16 crore square feet built up area will be ready within the next two years. It aims to add 1 lakh more professionals within the Technoparks itself. A land acquisition policy without eviction is on the anvil. An integrated start up complex at Kochi, specifically focussed on areas such as Robotics, Artificial Intelligence, Space technology and Cancer diagnostics, is planned to cement the state's supremacy in this area. Twelve more public sector units are poised to make profits from this year as the overall profit has gone up to Rs 160 crores. The budget also proposes a host of diversifications by Kerala State Drugs and Pharmaceuticals and Kerala Minerals and Metals Limited. The tourism sector has been allocated Rs 372 crores with the continued stress on marketing. Kerala Boat League to promote Chundan vallom (snake boat) race, spice route and heritage projects are some of the tourism projects proposed. The Bekal-Kovalam water way, a cost effective transport mode of the past with fresh avenues for backwater tourism is scheduled for completion by 2020. The energy sector is aiming for 1000 mw solar power, 'Dhyuti' for reducing transmission losses to 10 per cent and a comprehensive plan to migrate to LED bulbs. The North-South rail corridor and the effort for 'designed roads' for the new age are the other infrastructural projects in focus. The shares for schemes entirely for women and the women component plan have been raised to 6.1 per cent and 16.85 per cent respectively this year. The branding of the products of Kudumbasree micro enterprises and their fresh role in services aimed at raising the income are the hallmarks of projects under this. The plan allocation for Special Component Plan (SCP) for SCs and Tribal Sub Plan (TSP) for STs at 9.8 and 2.8 percentages respectively of the total budget outlay is more than the population percentages of SCs and STs in the state. This is at a time when the Modi government at the centre has done away with the practice of committed share of allocations to welfare schemes since 2017-18. The Life Mission, aimed at 'houses for all', has achieved the first stage by finishing the houses that were left incomplete under various previous schemes. The second stage of providing houses for those who own land but are houseless would be completed by March 2019. An amount of Rs 1296 crores is earmarked for housing complexes for the landless and homeless as the third phase. The burning issues of the coastal population are being met through – rehabilitation from inundation, offshore break water zones to prevent sea erosion, cold chains and educational facilities under a Rs 1000 crores package. The welfare pension for the workers has now got a coverage of Rs 42 lakhs of which more than 10 lakhs workers started earning this under the present Left Democratic Front government. This government had doubled the monthly pension amount to Rs 1200. Kerala's universal health security scheme launched this year challenges the Ayushman Bharat on all fronts. Ayushman Bharat, which is offered more as a pre-election jumla than a well thought out plan and corresponding allocation, proposes to cover only 18 lakh families from the state with the centre paying 60 per cent of the premium. Kerala was offered a premium amount of Rs 1100 under Ayushman Bharat. The hoax here is evident as the state was already paying a premium of Rs 1250 under Rashtriya Swasthya Bhima Yojana for expenses up to Rs 30,000 per year, covering 42 lakh beneficiaries. In other words, the centre is willing to cover hardly 10 per cent of the overall expense of the state under health insurance. The state's alternate plan with universal coverage offers treatment worth Rs 1 lakh through accredited hospitals via the insurance company and the super speciality treatment from 1 to 5 lakhs directly from the government. The scheme aims at improving the family health centres as the lowest tier with a minimum of three doctors and a full day Out Patient service. The taluk hospitals, district hospitals and medical colleges offer secondary and tertiary care with super speciality facilities. The government is planning to rope in the private hospitals in the state also to the scheme which would cover over 80 lakh families of the state. The programme to impart high quality into the public funded educational institutions has been a runaway success. The increase in fresh enrolment of students in government schools by 2.5 lakhs is a clear evidence of this. An amount of Rs 2037 crores has been allocated through KIIFB and 3656 additional posts have been generated for continuing with the current transformation in the education sector. The Kerala Bank is poised to become the first scheduled bank in the co-operative sector in the country. The apex state co-operative bank, district co-operative banks and 800 branches under it, will become the largest banking service network in the state. The local self governments would be provided with Rs 21,000 crores this year, though absence of innovative projects and the tardy progress towards multi level plans still haunt.